Back in December, I did too much activity in a short period of time and my body rebelled. On a Thursday, I went to a free class at California Kickboxing in Pasadena. They kicked my rear end. I took a fall in the beginning of the class onto the mats, but I was fine and continued. The instructor, Joseph, was amazing. There was a moment when I was having trouble with some of the instruction that he was giving me and he said, “That’s because it’s new. Forget that it’s new.” It was like something clicked, a light went off, and I got it. I stayed for about 75 minutes until I finally had to jet. On the Saturday, I went to an indoor rock climbing gym, called Rockreation, with Tyler and Brian. We started climbing at about 10 am and climbed until about 5 pm. It was awesome. My rear end still hurt from all the jumping squats I’d done on Thursday, but I gave it another good workout… And while on Thursday my arms were mostly punching and striking, on Saturday they were pulling and pushing and quivering. I shred my forearms to pieces. Sunday. I had intended to run about 12 miles because I’m training for the LA Marathon and it was a long run day. I wasn’t sure if running the whole thing would be the best for me, so I decided to punch it down to 9 miles. So on Sunday, I found myself at the Rose Bowl, trotting three times around the 3.1 mile loop. At about 6.2 miles, I realized my arms were in pain. I had thought that my arms would be fine, because “after all, it’s only running!” but I was wrong. I keep them bent at a 90′ angle the whole time and that was using my exhausted muscles! I finished at a 13 minute per mile pace. Slacker! And made my way home. Once I hit the home turf, I started feeling weak. More weak than I usually feel after a long run. Ryan and I went to church (our church meets in the evenings on Sunday), and during church I was nearly ready to pass out. People told me I looked pale. So instead of hanging out with everyone afterwards, we came straight home and Ryan made dinner. I felt better after I ate but I still needed to sleep. I was weak for another 48 hours while my body recovered. What happened? I’d pushed my body too hard and I was literally, actually, for reals exhausted. No kidding right? But I learned something. I learned my limit and I think it’s a heckovah lot farther out than I would’ve guessed! I also learned the value of a rest day between intense workouts. Rest is part of improvement. For some of us, that concept might be new. Ryan and I have been on a tight budget. That is not to say that we’re broke. In fact, our giving is up, we’re making respectable contributions to our IRA and we’re paying down our debt in a responsible fashion. But because we’re doing all these things, what’s left doesn’t leave much room for shopping sprees or reckless recreation. 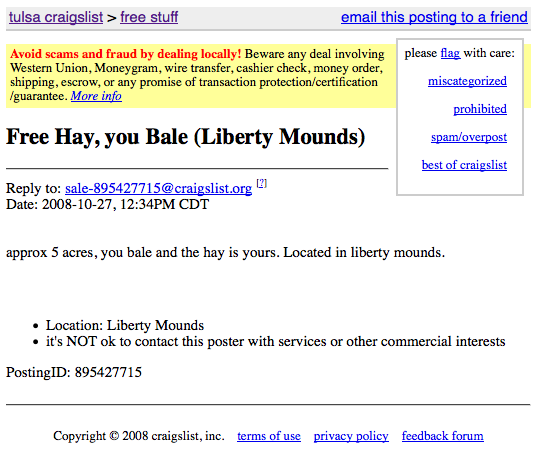 I thought it was cute that free hay was located in Liberty Mounds. If you’re looking for something to pass the time, I’d like to recommend FreeRice. Basically, you play a vocab game and ads run across the bottom off the screen. The longer you play (or: the more words you get right), the more ad revenue they generate, and the more rice they’re able to donate through United Nations! For every word you get right, they donate 20 grains of rice (it was 10 grains, until yesterday). You increase your vocabulary and people who need it most get fed. Win-win! Ryan and I were interested in how the math works out… On Monday, the website generated over 180,000,000 grains of rice. There’s about 7250 grains in one cup of rice. So Monday promised about 24,000 cups of rice. One cup of rice after it’s cooked will feed 2 to 4 people. So Monday fed 1 cup of cooked rice to between 48,000 to 96,000 people.